Political commentator Andrew Bolt said recently that Australia is fundamentally not a racist country. He’s wrong. Ok, that’s hardly a phrase that’s in uncommon usage when talking of Andrew Bolt’s views, but in this case he’s really wrong. The Anglo-Australian nation and culture was founded in racism, and racism is wound into the fabric of many of the artifacts that still hold Australia together today. Racism is arguably so embedded in the Anglo-Australian culture, that many don’t see it. There. I’ve said it. And so, according to a study done by the University of Western Sydney, have 85% of other Australians. We, as a country, have a problem with racism. “I may be overly sensitive. I may see insult where none is intended. Maybe my position of relative success and privilege today should have healed deep scars of racism and the pain of growing up Indigenous in Australia. The same could be said of Adam. And perhaps that is right. ‘Estranged in the land of our ancestors’ – that’s the environment that the Anglo-Australian culture has created for Aboriginal Australians. And while most Aussies of non-aboriginal descent would undoubtedly consider themselves to be more enlightened than our forefathers, we still allow our blatantly racist infrastructure to stay in place. Comfortably racist. That’s a fairly accurate description. And the reason it’s so ‘comfortable’, is that it’s embedded in the Anglo-Australian culture to such an extent that it’s seen as normal or harmless. Like the chips in the paintwork of your home, you walk past them every day and after a while you stop noticing them. The core principle behind the ‘colonisation’ of Australia in 1788 was a belief in the absolute superiority of the British race. England didn’t declare war on the Aboriginal people when they sent the First Fleet here – they might have undertaken plenty of war-like behaviour after the First Fleet’s arrival – but there was no official war declared. Australia was not taken by ‘conquest’. Furthermore, there was no treaty signed with the Aboriginal people – no exchange of goods to buy the land. And this legal fiction, that Australia was uninhabited at the time the Brits arrived, was maintained for over 200 years. It was only in 1992, that the Mabo case in the High Court overturned this, and that our legal system finally recognised that the Aboriginal and Torres Strait Islander peoples owned the land prior to the Brits arriving. Two. Hundred. Years. That’s how long it took to overturn a racist lie from the 18th century. Are you beginning to get an idea of just how entrenched racism is in our nation’s make-up? A constitution is arguably the most powerful legal document in any democracy. It may seem like a boring document – and having studied constitutional law, I can tell you that it reads like a boring document. But in terms of its power, it sits above the Prime Minister, the parliament and the courts – making it very important indeed. When the framers of the Australian constitution sat down at the end of the 19th century with the goal of bringing together the various states at the time of Federation in 1901, Aboriginals were not considered by them to have – and I quote – “the intelligence, interest, or capacity to stand on the same platform with the rest of the people of Australia” in order to have the vote. Nor were Aboriginals to be counted in the census. They were literally considered not to count. Today, while issues with the vote and the census have since been resolved, the Constitution – the legal framework for this country – still fails to acknowledge Aboriginal Australians’ traditional sovereignty. It’s a small thing. But it’s a big thing. It’s what Australians flash around the place to indicate that they are Australian. And we are one of only two ‘colonies’ – New Zealand’s is the other one – that still retains the British stamp on our flag. New Zealand is about to change their flag. It’s time that we did too. By way of comparison, the second verses of both the South African and New Zealand anthems are in Zulu and Maori respectively. 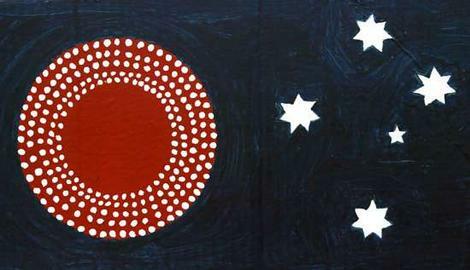 It’s about time we found an anthem which recognised that our history didn’t start in 1788 and acknowledges and respects the traditional owners of this land. OK – how many non-Aboriginal readers of this article know how to say ‘Hallo’ in any of the estimated 700 Aboriginal languages that existed here in 1788. I’m guessing it’s the tiniest of tiny percentages. By way of contrast, in New Zealand, the Maori language is taught in over 1000 schools, and there have been discussions about making it compulsory. There are 364 other days we could pick – we should move it. What would Paris be without the Mona Lisa and the Louvre? What would Egypt be without the Pyramids? England without Stonehenge? Florence without the Statue of David? Pisa without the leaning tower? I could go on – but I suspect you get the general idea. Around the world great antiquities and ancient sites are valued, protected and appreciated. People queue up to see them. Museums and galleries around the world go to great lengths to identify antiquities and obtain items significant to their culture. We, on the other hand, have a continent FULL of ancient works of art and sacred sites. But not only aren’t many of them protected, most of us don’t even know where they are. The Western Australian government just deregistered what is arguably the world’s oldest rock art collection so that the Mining companies can get their hands on the site. 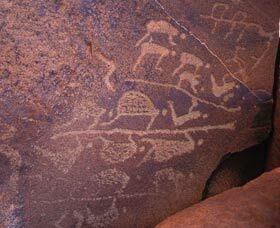 The site is dated at more than 30,000 years old – THE WORLD’S OLDEST ROCK ART – and there was barely a whimper about it in the news. What do you think would happen in Egypt if they discovered coal under the pyramids? Do you think they would allow them to be destroyed? NOT IN A MILLION YEARS. Well – unless Abbott was their Prime Minister of course – then the Pyramids would be gone in a matter of weeks. The above are just examples of the many ways that we disregard and devalue Aboriginal culture due to the historically racist perspective that it is unimportant. With the exception of discussions around the Constitution – which have been in the news quite a bit recently – most non-Aboriginal Australians wouldn’t even notice that the issues above are problems, so embedded are they in the Anglo-Australian culture. And if you think these things aren’t important – think again. They set the tone, they set the framework within which values and behaviours are fostered and learnt – and make it hard for us to root out the racist attitudes that have been a part of the Anglo-Australian culture for so long. Another key reason we may not immediatelly recognise behaviour as racist is that we often assume that racist behaviour is associated with overtly ‘bad’ actions like violence or abuse. But this isn’t always the case. Racism is an attitude rather than an action – which means it can also be expressed through actions and speech which might otherwise seem to be ‘good’ – like kindness or patriotism. And the thing is, even when racism is expressed through kindness or patriotism, it can be just as venomous. Here’s some examples of different ways that racism has been expressed towards Aboriginal Australians over the past 225 odd years. It wasn’t long after the British arrival in 1788 that the first massacres of local Aboriginal tribes took place. This violence – recently renamed ‘frontier wars’ – was seen as ‘unavoidable’ by the British, and continued to flourish in the 19th century. The exact number of Aboriginal deaths is unknown, but it was certainly in the tens of thousands, and possibly more than 100,000. Racism expressed as violence took Aboriginal life and land. Racism expressed as kindness, protection and good works aimed to take away what was left – their culture, their way of life, their families, their language, their history, their spiritual beliefs and their pride in who they were. Here’s how. The British clearly did not see themselves as violent invaders – they saw themselves as as “enlightened and christian” benefactors of the indigenous inhabitants of the countries they ‘settled’. They looked upon the indigenous inhabitants of the lands they colonised – not just Australia, but other lands – with a degree of pity, and settlers were instructed to use ‘humane means‘ to defend themselves when taking control of the land that they saw as rightfully theirs. Of course, had the Brits been serious in their concern for the well being of the indigenous inhabitants, then they would have stopped their wanton ‘colonising’ – but the racist attitude behind their concern meant that this wasn’t going to happen. Instead, they set up ‘Protectionist’ boards and installed people with the title of ‘Protector of Natives’ to ‘look after’ and ‘civilise’ the ‘indigenous folk’. They also sent out truckloads of missionaries, which they saw as their greatest gift – primarily to educate and ‘improve’ the children. This theme of ‘protection’ – in various forms – continued in Australia right through the 19th century and into the 20th century, when in 1915 the NSW Aborigines Protection Board was empowered to remove Aboriginal children from their families at will. They had been able to do that prior to 1915, but only with a court order. Similar practices were implemented in other states which continued up until the 1970s. Once in ‘care’, children were instructed to no longer speak the language of their parents and taught to forget Aboriginal culture and practices. Just as being kind to or protecting someone is normally a positive thing – so is patriotism. But it too can be incredibly destructive when it is driven by racism. Take the policy of ‘assimilation’ – so admired by the Reclaim Australia folk – which was implemented by the Australian Government in the middle of the 20th century, as a tool of patriotism to ‘unite the nation’. The policy was designed to suppress and kill off the aboriginal culture, language and heritage – again, in the misguided belief in the superiority of the Anglo-Australian way of life. Aboriginals were offered limited citizenship at this time on the condition that they ceased practicing Aboriginal customs, did not speak their native language and did not mix with any friends or families who hadn’t also agreed to the same terms. Looking at these three examples of different expressions of racism, it’s clear that while the outcome of racism is normally pretty bad for the recipient, the perpetrators of non-violent racist behaviour (such as kindness or patriotism), often believe – albeit misguidedly – that they are doing a good thing. Their racism blinds them to the true impact of what they are doing. And this is another reason why it is so difficult for Anglo-Australians to see this in themselves – because racism can be well-meaning, or at least not intended maliciously – like the booing of Adam Goodes recently. 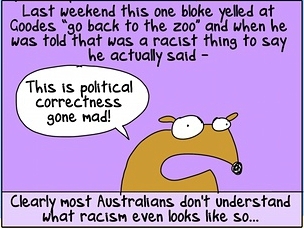 Ok non-Aboriginal Aussies – we don’t have a good track record when it comes to racism. In fact we arguably have a bit of a blind spot – often not from any malicious motive, but purely because of how embedded it is in our culture and a misunderstanding of what it is. But that doesn’t make it any less racist in the way it is experienced by those on the receiving end. This includes the examples I’ve noted above, but there are others as well. It’s not hard – it just takes the will to do this. Don’t believe the politicians who want to stall this for their own political motives. It may take some time to get consensus, but if we want to do this we can do it. It’s that simple. Delaying the rectification of these issues is just more racism, as it undervalues the importance of these issues to Aboriginal Australians. This was a campaign designed by Beyond Blue to counter discrimination in our community – against a whole host of problems. And it is a key antidote to racism. The way to eliminate racism from our national culture, our national values is first to take the time to notice when it’s there and then to turn a racist attitude into respect. Last week, after Adam Goodes had called out racism from the AFL crowds, we all stopped, thought, and then – it took a little while – but then we showed respect. We need to do that across the board.